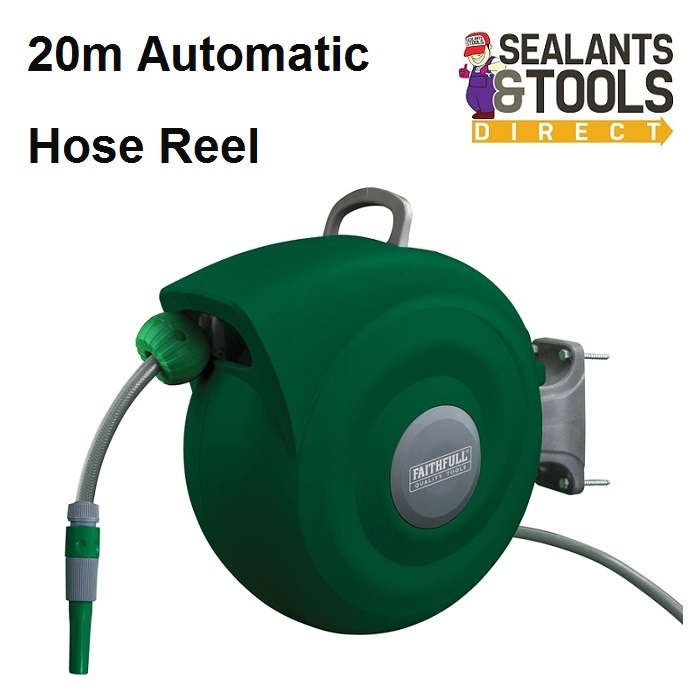 This Faithfull 20 meter Automatic Hose Reel is an auto wall mounted hose management system that smoothly and easily unwinds and automatically rewinds the hose away after use. The Hose pipe can lock the hose in any per-set position at 15cm (6in) intervals along the length of the hose, to unwind more hose simply pull and the mechanism will unlock. To rewind give the hose a simple tug to release the safety latch and the hose will automatically rewind into its case using a self-layering system to avoid kinks or tangles. The swivelling wall mount helps you to reach every area of your garden and allows the reel to be folded close to the wall after use. A quick release bracket pin permits the removal of the hose case for storage over the winter and features a padlock shackle hole for added security. The Auto Hose Reel is ready assembled (once mounted) for instant use. Supplied complete with a 20 metre reinforced quality braided hose, universal fittings, a spray nozzle and fixing bolts.